We have two games again for you this week. Let's see what they are. Our first game is Crazy Kong -Part II-. Crazy Kong -Part II- is brought to you by Falcon and was released in 1981. Crazy Kong -Part II- is a clone of Donkey Kong by Nintendo. It is commonly mistaken as a bootleg version of Donkey Kong but Falcon was officially licensed for non-US markets. With a delay in the production of Donkey Kong cabinets due to Nintendo of America moving locations. There was approximately 20,000 Crazy Kong cabinets were illegally brought into the US. The video and sound capabilities were lacking in the Crazy Kong compared to Donkey Kong due to the different hardware it ran on. Which gave the game much worse sound and a poor colour scheme for the game. Most of the sound effects are different and the background music is missing completely. The animations for Kong are also different and often do not sync with the Kong's actions. There are also mild changes in game play. The game consists of four stages. Stage one (25 m), is a seven-story structure made of crooked girders and ladders. Stage two (50 m), is a five-story structure of conveyor belts. Stage three (75 m), is a multilevel structure With elevators. Stage four (100 m), is a five-story structure with the eight rivets that need to be removed. Once all stages are complete you go back to stage one being slightly harder example stage one has more and faster barrels and gaps in the structure leading to the top. Our second game is Arabian Magic. 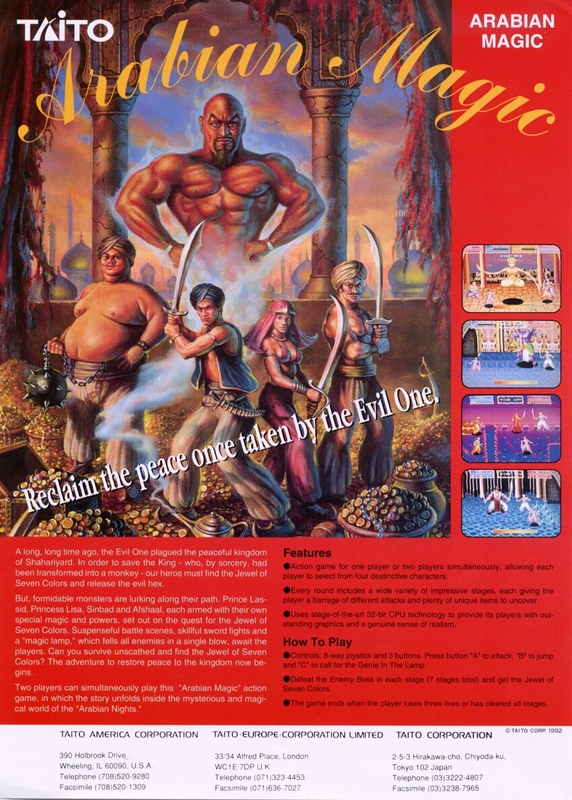 Arabian Magic was released in 1992 and created by Taito. Arabian Magic is a 2.5D horizontally scrolling hack and slash game set in the mythical Arabian Nights world. The once peaceful kingdom on Shahariyard is under attack by the Evil One. You are tasked with saving the king which has been transformed into a monkey by the Evil One. To save the king you need to find the Jewel of Seven Colours to remove the evil hex. You have four heroes to choose from for your quest. Prince Lassid - the sword wielding hero, is a well-rounded character who has excellent speed and fast attacks. Princess Lisa - she has excellent reach with her magic-based attacks and also has a special spinning move, performed by tapping forward twice. She is a fast character but suffers defensively. Sinbad - is a powerful character with a very useful flaming sword attack, done by holding the attack button and then releasing. Afshael - much like Lisa, Afshael has excellent reach with his flail and also has a similar spinning attack done in the same manner. He has high defense but suffers in speed. All heroes are able to summon a genie which stays on the screen for a short time blowing and striking the enemies around the screen. There is seven levels to the game each level has a different amount of stages within them. Each level has a powerful guardian waiting for you at the end of the level. When each guardian is defeated they will drop a jewel which forms a part of the Jewel of Seven Colors. Also once the guardian is defeated they will join the you and become a spirit you can summon the same as your genie.